I've always believed that miracles can and do happen. I've even witnessed one or two. at St. Thomas More School, anyway (back when dirt was new:). Yesterday I lost my Sketchbook Project sketchbook. if it wasn't there the first 2 times, it won't be there now. St. Anthony, the patron saint of lost articles. ...skeptical, but hopeful and desperate enough to believe. of one final place I hadn't looked. with a bunch of camera paraphernalia. The book is small. I must not have seen that it was buried among the CDs. fill all the pages by the deadline. brains by the energy that is "St. Anthony"? OK, now for some BIGGER news than my lost sketchbook. for those who live far far away). in Pittsburgh for the past six weeks. Inspiration Avenue buddies and favorite artists. checking out the shops and restaurants. whom it was also a pleasure to meet! Deb is full of energy and kept us moving along. Lisa and Deb to go to Mia's performance. fresh corn for dinner on the way home. All in all, a lovely Saturday! Aw I didn't know you were meeting up with Lisa, how lovely!! I wish I was near enough to have joined you - that bookshop sounds fun!! What a great story. I am not sure but I know that I have prayed to Saint Anthony for help but just can't remember what happened but we did pray to St Joseph and placed a statue in the ground when our house would not sell and it sold the next week. I felt very funny when we did it but I feel that it made a difference. We have the statue in a special spot in our house today. 15 years later and I still feel that was a miracle. 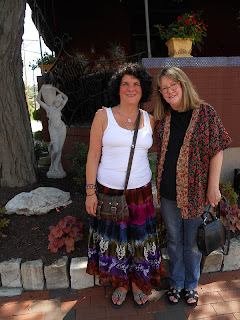 How fun that you two got to spend time together and explore interesting places. Maybe another miracle.. or at least it made me smile to see the picture of you both together as I have a painting from each of you in my art room. I was thinking I should put a copy up and then have the artists with the art. Life is full of big and little miracles isn't it. *Angie ~ wouldn't it be nice to meet up...I wish you were close enough also! If only there were a sort of central-ish location. (I know, the middle of the Atlantic is out of the question)...hmmm, it would take some planning for sure but, not impossible? *Kathy ~ Good luck with your classes! 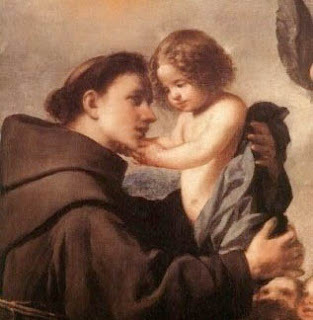 St. Anthony is a very interesting saint, as I just found out. *Amanda ~ I have heard about burying a statue of St. Joseph to help sell a house. In the stories I've heard, the houses were sold quickly! I think it's wonderful that you have a painting from both Lisa and me!